Senior captain/forward Matt Paolatto (17) wins a second period face-off. 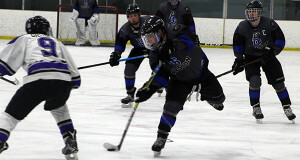 Sophomore forward George Herlihy (3) fires a shot on net during a rush up the far-side boards. Coming off consecutive defeats against Westwood (3-2) and Hopkinton (5-0), the DS/Weston varsity boys hockey team entered a must-win contest against Norton on Saturday afternoon in Foxboro in order to keep pace for a spot in the Division III state tournament. Behind a pair of goals by sophomore forward George Herlihy, the Raiders (4-6-2, 3-2-0) got the result they wanted with a well-fought 4-2 victory over the Lancers (1-10-2, 0-4-2), but it did not come easily. The Raiders completely controlled the tempo of the first period, dominating the time on attack and forcing Norton to ice the puck a whopping eight times. But despite the Raiders dominance in both zone time and shots on net, the game remained scoreless after one period. It only takes one shot to completely change the momentum of a hockey game, and unfortunately for the Raiders, that was exactly the case just 5:16 into the second period. A shot from a sharp angle on a rush up the left side somehow found its way through DS/Weston goalie Zachary Korbin to draw first blood for the Lancers and swing the momentum towards Norton, despite DS having completely dominated the contest thus far. With 8:30 remaining in the period, the hockey gods continued to favor the Lancers as a wicked wrister from the slot by Max Tjen rang iron, then bounced through the crease and out the other side, keeping the game 1-0 in favor of Norton. However, at 10:21, DS/Weston finally broke through when senior captain Matt Paolatto fired a crisp cross-ice pass to Herlihy during some sustained zone time. The sophomore buried a wrist shot blocker side to knot the game at one. A big glove save and cover-up by Korbin with 2:37 remaining kept it a 1-1 game at the end of two periods. The Raiders entered the third period as if they’d been shot out of a cannon. Just 12 seconds in, Herlihy buried his second of the contest, a backhander following a rush off of the opening face-off to give DS/Weston its first lead of the contest at 2-1. The game remained 2-1 until 3:38 to play, when sophomore forward Tommy Higgins intercepted a Norton breakout pass and fed a pass to Henry Kenney in the slot, who riffled a snap shot upstairs to double the lead to two goals at 3-1. 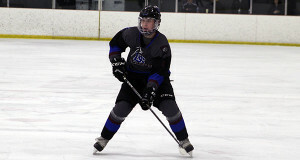 Sophomore defenseman Billy Rooney (pictured) holds the puck in at the blue line and gets set to fire a shot on cage. Norton cut the deficit back to a single goal at 3-2 with 2:25 to play and opted to pull the goaltender for the extra attacker to try and knot the score at three. Junior forward Cooper Griffin delivered the dagger with an empty netter with 1.9 seconds to play, and the Raiders emerged with the 4-2 win. DS/Weston will look to keep up their winning ways when the Raiders host Norwood up in Weston on February 2.